Marcus Wong. Gunzel. Engineering geek. History nerd. 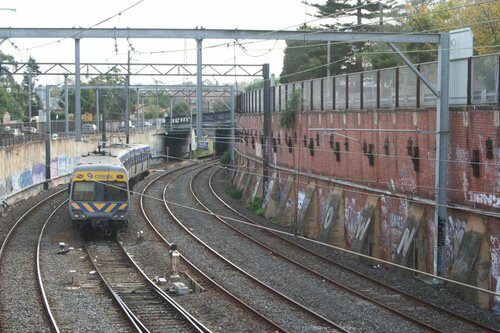 Motorists crashing through fences and onto the railway tracks seems to be an ongoing theme in Melbourne. Whether driving too fast for the conditions or confusing the brake pedal for the accelerator – it doesn’t matter how, but their cars end up on the tracks, delaying rail services. So how are they prevented from ending up at the bottom of a deep concrete hole? The railway cutting at Camberwell was built back in the 1920s, with the red brick walls having been patched up many times in the decades since. A low steel guard rail prevents cars on the parallel streets ending up on the tracks, with a rusted cyclone fence preventing people from doing the same. Gardiner station is a modern example where shotcrete and piling forms the cutting walls, but graffiti still covers virtually every surface. 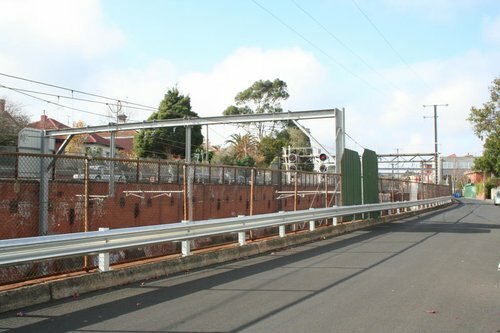 Here parkland separates the railway from the streets that parallel the tracks, so a cyclone fence along the top of the cutting wall has been deemed sufficient protection. 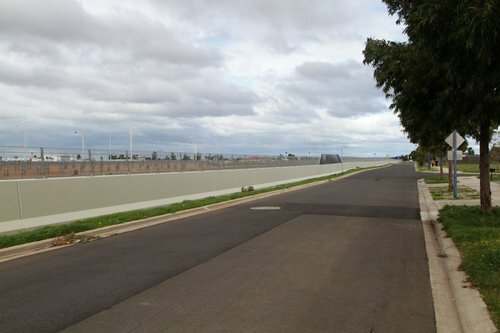 At the other end of the cutting is the railway station car park, so a waist height concrete barrier has been added to prevent motorists ploughing through after confusing the brake and the accelerator. Over at Mitcham station is a similarly deep railway cutting. At the Ringwood end, concrete barriers prevent motorists from bunny hopping out of their parking spaces. But at the city end, a concrete kerb was deemed sufficient protection from motorists, who instead park at parallel to the tracks. Finally we visit Wyndham Vale station – located on the other side of Melbourne and hewn out of solid basalt. 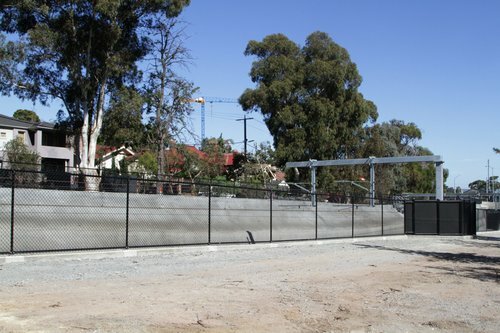 Here a residential street parallels the tracks, so a solid concrete wall follows the top of the cutting, topped with an even higher welded mesh steel fence. 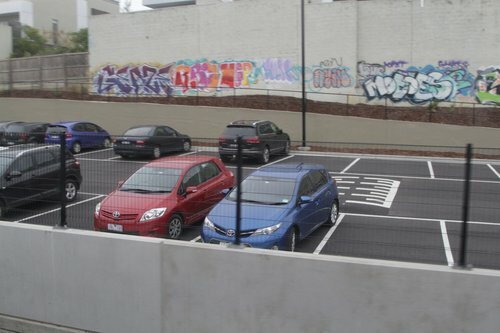 And in a similar vein is this incident from February 2016 – car lands at bottom of 10 metre deep hole after driver sends it crashing through hoardings at a construction site in Flemington. Have you ever noticed how news reports normally state that a car lost control, not the driver? The language of driving is hard – with accident, not crash the default term – a phenomenon that Streetsblog USA explains further. Even I had to edit my initial draft in order to get across that drivers are the ones that screw up! Skyrail – now you can bet on it! Be honest anyone confusing the two needs to be stripped of their licence for 12 months pending a driver training course. I also think a fine of $10,000 for anyone who disrupts heavy rail in any way or form, be it a car or suicide. Re the footnote about the car being the actor, not the driver. I’d suspect that a lot of this is the sub judice rules. Once a person has been arrested or charged (and possibly even earlier), you can’t publish anything that says the driver did something. You will still fall foul of the sub judice rules for what you publish before the driver was arrested or charged if the item is still available after the the driver is arrested or charged. You can say factual things, however. So saying the car did something is much safer; this doesn’t say anything about *why* the car did it. It is an area that journalists have to be acutely aware of, but I’m yet to be convinced it is the reasons that news articles on car crashes are written the way that they are. Of course a motorist is meant to be responsible and in-charge of the vehicle but if we say the car did it it sounds like we can’t blame the motorist. The other one is calling it an “accident” when motorist crash every day. We have aircraft crash reports, amazing changing the language is part of why aircraft crashes are so rare. Need one on the so called “dangerous railway crossings” and motorists that break the law and then say it was the train drivers fault. They are also reported as “the train hit the car”, ignoring the fact that the train always has 100% right-of-way. Correct reporting would be the illegal motorist drove in front of the train. It is always illegal so no liability problems for the journos. A lot of Americans say “wreck”. And, not only when the car is actually wrecked. If someone bumps your car in the supermarket carpark, that is still a “wreck”. I publish a fresh blog post every Tuesday morning - enter your email address to receive each new post via email. 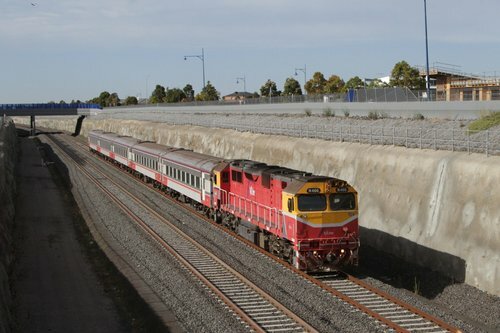 V/Line's fourth train for Albury - has anything changed? Copyright © Waking up in Geelong - Marcus Wong. Gunzel. Engineering geek. History nerd.